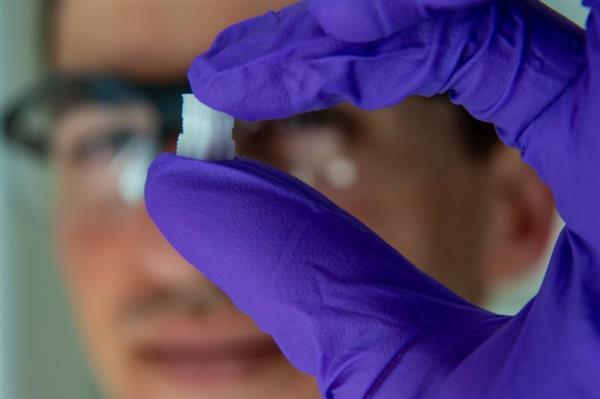 The scientists at Rice University and the University of Maryland engineered scaffolds that replicate the physical characteristics of osteochondral tissue — hard bone beneath a compressible layer of cartilage that appears as the smooth surface on the ends of long bones. The key is mimicking tissue that turns gradually from cartilage (chondral tissue) at the surface to bone (osteo) underneath. The researchers led by bioengineer Antonios Mikos 3D printed a scaffold with custom mixtures of a polymer for the former and a ceramic for the latter with imbedded pores that would allow the patient’s own cells and blood vessels to infiltrate the implant, eventually allowing it to become part of the natural bone and cartilage.